So it’s Halloween. Unless you are a) still really into dressing up or b) a parent, chances are this holiday doesn’t mean what it used to in your worldview. But that’s okay — there is Greco stuff to get to and none of it will rot your teeth. As you’re probably aware by now, the US boys had a pretty solid day at the Klippan Cup in Sweden on Saturday. Jordan Auen (59 kg, NMU-OTS) and G’Angelo Hancock (98 kg, NYAC-OTS) both earned gold medals after facing off with some tough competitors. Hancock, who is coming off of his Junior World bronze medal performance two months ago, defeated Emil Sandahl (HBK Bergania), a former World Team member himself, in the final 2-1 to nail down his tournament victory. For young Mr. Auen, this was quite an arrival. The Californian has stepped up his game by continuing his career at Northern Michigan and the results right out of the gate are tough to argue with. 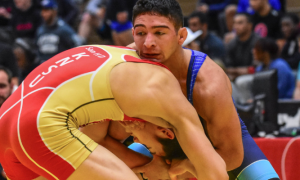 An international tournament victory complete with a couple of tight wins and a tech in the finals made Saturday’s performance one he is now going to be measured against going forward. But that is precisely the idea for these tours — to build confidence and experience, and if eyes are opened in the process, so be it. Jesse Porter (75 kg, NYAC-OTS) also made it to the podium, coming in third. Porter is another one who possess gifts in nearly every phase of Greco Roman wrestling. He’s strong, fights like an animal in close, and is constantly on the uptick. It’ll be interesting to see how he progresses as he begins to see more Senior-level competition. And then there was Alston Nutter (NMU-OTS), who went up to 66 kg to get some matches in at the Klippan Cup. Nutter had himself a strong outing, as well, going 2-2. He was defeated by 2016 University National champ Austin Morrow (NMU-OTS) in his fourth bout. What else can you say? Nice work for a high school junior. In related news, there will be a dual meet this Wednesday between the US and Team Skåne Brottning. Both Cadets and Juniors will be involved and there will be a live stream available on Facebook. Go here for more details. 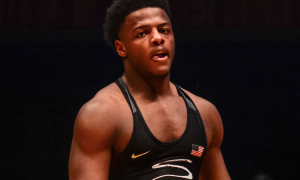 The 19-year old Senior National Team member was recognized as USA Wrestling’s “Athlete of the Week” thanks to his win on Saturday. Makes sense. Hancock blitzed three opponents in a row before being pushed in the final. He’s also had an outstanding year altogether, but you knew that already. Hancock should probably start getting used to the spotlight more and more at the rate he’s going. Two-time Olympian and current Wheaton College head coach Jim Gruenwald is the feature interview this week and it is an awesome piece of literature. Gruenwald is as passionate about Greco as you could possibly imagine and shares some incredible perspectives on faith, his time as an assistant under Ivanov at NMU, training, and his competitive drive that are likely to make an impact. He had been in our plans for a long time, so it was great to finally get a chance to get insights on his career and the sport in general straight from the source. Just, wow. The new “Coach Lindland’s Report” is already out. A fairly wide range of topics is what you can look forward to this week. For one, Coach Lindland stopped by the Minnesota Storm’s mini-camp last weekend, so we talk about how much that club has meant to Greco in this country. Also covered is the Indiana Coaches Clinic, the Sweden tour, and why young athletes committing to Greco early makes a difference. One of several previews covering the Bill Farrell/NYAC event. Some other stuff. You know the drill.